Actually, I wanted to blog this for a while but the last earthquake sort of shaken off my idea. It is a spin-off from Andreas of Always WOW entry. He, being an angmoh, found that the scenes at some restaurants a little yucky. And someone posted this comment which I do agree, eventhough Andreas did not quite like it. Who wants to refute this? In Penang, we have a place where a person can actually squat and eat their meals. They put a stool on top of the bench and you climb on the bench, sit on the stool and with both your knees jutting out, above the table, you eat, Pretty cool, hor? When I get a photo, I will post it. However, only the Chinese trishaw riders eat in this position. Maybe one day I challenge myself to pose, order a bowl of porridge and take a photo? Am I ashamed of this? Of course not! I am a Chinese and accept some of our quirky manners. But of course, we can certainly try to be more civil and neater. Why do we feel awkward in places like these whilst we feel at home in Chinese restaurants? It is just eating, right? Why do they appear so well-mannered, speak so softly and just seem so out of place? Take for e.g. eating the buns. I would take it, tear off a piece, dab a huge piece of butter, open my mouth big big and stuff into it. But some of the patrons sort of spread the butter in slow motion and then, hold the bun with both hands and open their mouth small small and bite a little bit. Must we tune ourselves to match the angmohs environment even if it makes us feel uncomfortable? Well, let me leave you with a random shot taken by my 13 yrs old at the hawker centre. Read : Hawker Centre. Dress code: Black number with high black faux leather boots. If you are not a Chinese, tell me what are some of the things you find quirky about us? 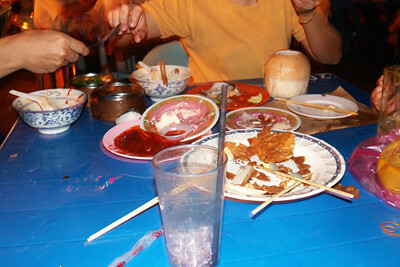 If you are a Chinese, do you agree we are very messy when come to eating? And no, this is not a racist topic. i find loud slurps and talking with a mouth full of food, very unpleasant…these are pretty common sights in a chinese dining table. yea, i do i agree that we’re very messy when it comes to eating. It actually depends where you are eating. Heh. Chinese are loud and not so clean when it comes to eating in a public place. I wouldn’t call it dirty because it is such a strong word. Have you ever been to Chinese restaurant which is quiet? Never. Hhehe..Even the ones here in UK are just as noisy as ever. Actually even noisier than the ones back home. Reason: The clicking of the chopsticks, the scrapping of the food platter and the chatter of the people eating. It is part of our culture. If I were to go to a Chinese restaurant which is quiet, I would freak and feel so uncomfortable. About our cleanliness, yeah…we are a bit not so clean. We spit fish bones on the white table cloth and then spill soya sauce on it too. After that we leave chicken carcasses on our empty plates and wash our hands with the chinese tea after that. It is part of our culture and am I proud of it? Yes, I am. How many cultures in world have such unique eating habits? About eating bread in an ang moh restaurant? Never eat it like a hamburger. It is rude. Always pinch it a little bit and then spread some butter over it and then only eat it slowly. I’m sure you’ve been to chinese wedding dinners where ppl throw the leftovers and bones and whatnots in the dish plate after finished eating the dish. The waiters and waitresses do the same thing too. If you don’t throw them in, they will do it for you. Even in a 5 star hotel, they do the same thing too. There’s one thing I dislike about the chinese eating habits- spitting on the table. I see my housemate’s mom doing that on the dinner table and it spoilt my appetite! My husband’s pet peeve about me eating.. is the chewing too loud.. or with the mouth open.. or talking with a mouth full..!!! hehehhe!! And that i continue to slurp on my empty cup for 5mins.. to get the ice.. hahahhaha!!!! Was born in Malaysia. One thing I do notice during my travels.. Few years ago Hawaii and many parts of Canada were very popular with Japanese tourists. While they do talk loud, they pretty much on the whole are polite and tend to observe common courtesies…However in the past few years, China tourists took over, we now have Q-jumpers, people hogging tourist hot spots for ages to pose for pictures, people squatting all over the side of the road, and yup lots of hawking and spitting and clearing their noses. At one point one idiot couple almost knock my child over board the schooner just to get the perfect photo..Not even a word of apology.. AND we recently had pictures in the local papers of these people in fancy restaurant s with…aarrgh one foot on the chair and scratching their feet. when i was working in Penang, i stayed with a Chinese lady – a very meticulous lady. We’d take walks along the esplanade in the evenings and she’d advise me against eating at the stalls! Now that I am so far away…I want to eat at those stalls, those rojaks, mee mamak (nevermind if they’ve not changed their sarungs), ice kacang ..prawn noodles.aaaarghhhh! I’ve spent several months under the same roof with Chinese housemates back melaka. What I noticed whenever I go out dinner with them, is that they like to talk with their mouths full. I don’t see this among chinese girls, though. If we’re eating at home [sometimes i empty a whole can of tuna and we gobble it up with bread while watching news or chinese dramas], they’re very meticulous about hygiene. But at mamaks, or other restaurants, they don’t usually care that much. If we’re at a hawker centre…eat just like how you would normally eat at home. If you’re at fine restaurants, eat with more manners. btw, did you send your 13yo to take the pix or did he take it by himself? Simon – My camera zoom very kerng wan, 12X optical zoom, 4x digital zoom with anti-shake mechanism (when zooming faraway object, people tend to come out with blurry photos due to slight shake). My kids, toddler included, have eyes to ‘see’ what is blogging materials. LOL! Dave, Silencer, S-Kay – Ya, kena jaga standard Malaysia Chinese Boleh. Kak Teh – Eh, eh, mamak nowadays all long sleeves and long pants, tak pakai sarung lagi. hush4m3 – Dun ler like that, finger licking good is for KFC advert only. romantic – yayaya, i have this peevee about China’s Chinese too. The closest I got to China is Shenzen and they scared the daylight out of me. It worries me when people says they are going to rule the world someday. Mrs T/Swermy/Eileen/Cherry/Kenjiro – Actually, some of the hang-ups about eating manners are those I learnt from reading Pride and Prejudice, Little Woman and those Enid Blytons. About washing up before meals, no elbows on the table, legs together etc etc. But in real life, in this modern times, I don’t think people do that anymore. And if I am rich enough to eat at that restaurant, no matter how chic, I don’t give a damn ‘cos I am paying! Of course, all the bad manners are left at home la. But still elbows on the table got la. Venus – Gimme a five! i got my elbows on the table also. letih la with all those manners. as long as tak letak kaki on the table, ok what. ay, ay, why cannot put elbows on the table? Only while eating or even when waiting for the food? Haha.. Chinese always has this habit of..
5) Even after a 15 course meal, they will still excuse themselve for more food outside that restaurant and resort themselves to mamak. 6) As I dont always pay the bill while with relatives, but they always have trouble paying it. No, they dont push the bill around, they keep insisting on paying it. Uncle A wants to pay, Uncle B wants to pay, my dad wants to pay. In the end, before the last meal arrives on the table, Uncle D actually paid already with the casher discreetly. What I enjoy being a youngster, I enjoy the drama and offer to take care of the baby who doesnt seem to stop walking. In the end of the day, I am still proud being chinese..
hmmm that pic was taken in northam beach cafe, no? haha. anyway i think there are a whole lot more chinks with more skimpy (read: less material) clothings and highER faux leather boots, straightened hair.. hmm cant leave that out somehow.. but this one is good enough of an example. ireally must add this…travelling on the london bus and then i could smell that familiar smell from that small bottlethey will never go without, that most chinese and some malays carry – minyak chap kapak!! turned around and sure punya – a bunch of malaysians sightseeing!!! really brought tears to my eyes in more ways than one. *nod head* Eating habits of Chinese can be quite messy sometimes. Has that any connection with the type of meals? “Talking with a mouth full of food…” Sorry not to all right. My mom always said… “Jangan bercakap kalau tgh makan” – Dont talk while you eat. Concentrate and lets enjoy your food… what and however it is. Normally guys are a bit messy when come to eating. About talking and eating at the same time, this one i really cannot tahan. No the food does not taste any better just because you eat with your mouth open and make all of those horrible slurping, sucking and lip smacking noises. It’s not big and it’s not clever and if you haven’t got good manners then don’t go into a fine eating establishment because you just make everyone else feel sick. It is also not clever to talk with your mouth full with food, it is so infantile. i realise that chinese had a bad habbit… in every dish or packet of food, they like to leave the last piece of food on the plate instead of finish it up. do u realise that? Hey, im not chinese but i like the sweet and sour chicken from this one chinese resturaunt. The chicken is AWE_SOME awsome awesome totally–> a cheer because i am a cheerleader. The messiness of ppl during meal time is all because of the education from families… Parents who consistenly teach their children to hav good table manners would not hav this kind of problems… It’s not only the chinese who hav this kind of habits… Every other races in this world hav the same problem too…!! Therefore, i absolutely oppose the idea of ” chinese” have bad table manners… Please do not be stereotypic when u are viewing any problems..
heh. i have lived with two chinese roommate girls before and been to china 4 times on long stays. (I’m not chinese). And I have noticed that a lot of them eat with their mouths open, WAY open. and smack their food. oh well..